All is going well with the pregnancy! 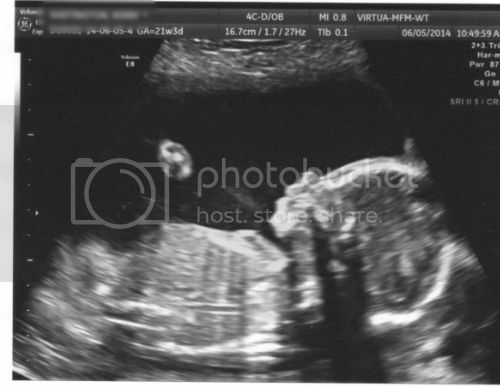 I had my 20 week ultrasound this morning and baby is looking great. Funnily enough, my 20 week ultrasound was supposed to be two weeks ago, they canceled it the morning of! I was super disappointed but made them tell me the gender, I was dying to know. We're having another BOY! He looks great (as the MFM doc put it - he's "disgustingly healthy.") This pregnancy is going easier than the last one. I'm a lot bigger than I was at this stage last time, but the heartburn and rib pain isn't as severe as it was last time. I've been feeling lots of movement since about 14 weeks. I'm talking to S about the new baby, and he likes to say "baby brudder" but I don't think he will understand until we bring the baby home. We're headed to Kansas City tomorrow for a week - our first vacation in a long time! And probably the last before new baby comes. I'll try to update a little more often, but can't make any guarantees. Happy summer!